Right then. Does anyone actually want to win this thing? It has to date been a thrilling title race, pegged out around Tottenham�s drive, Leicester�s gnarled and canny fairytale and Arsenal�s ability, week in, week out, to look like the best really terrible football team in Europe. For all that, the impression right now is not so much of a rush for the line but a kind of mass lactic burn as the final straight looms . After you, old bean. No, really, you go on. All four teams at the top have dropped points in the last two days. Here it was the turn of Tottenham Hotspur, faced with the chance to hit the front at this stage in the season for the first time since 1964. Instead Spurs lost a thrilling game 1-0 to an exceptional West Ham, paying the price for a first half at the Boleyn Ground during which they produced something new: a fretful showing, after Mauricio Pochettino�s team of hard-running warriors were surprised by the level of fury they met from their opponents. For 45 minutes Spurs were out-Poch�d, harried and nibbled away at all over the pitch by a furiously motivated, physically imposing home team. So high was the West Ham press that twice in the opening 50 minutes Hugo Lloris was almost driven back through his own six-yard box by a scuttling claret and blue demon. Spurs recovered to come pouring over the ramparts again, pushing their opponents back in a spell after half-time during which they could have scored at least twice. Too late, though. The plan still seems straightforward: keep on running, keep on playing that push-and-sprint football, the clarity of Pochettino�s approach an advantage in itself as the season narrows. Here, though, they looked for the first time a little anxious, a team for whom the corollary of playing with freedom because you�ve never been in this position before is the fact that � hang on a second � you�ve never actually been in this position before. There will be many more occasions like this from here, starting with a north London derby this weekend that � a quick scan of the rules confirms � it won�t actually be possible for both teams to lose simultaneously (a riot in the stands? ineligible players?) no matter how hard they try. As this game kicked off in teeming rain this clanky old corrugated arena was a brilliantly noisy square of light in the urban gloom. Spurs have been notable visitors to the Boleyn Ground over the decades. Not quite the ugliest rivals � that honour belongs to Millwall, other half of the misleadingly jolly-sounding Dockers Derby � but close enough to be prominent neighbours. With the crowd in a state of constant uproar it took West Ham seven minutes to score, Michail Antonio heading home from a corner having muscled Nacer Chadli out of the way. It was a wonderful header, further reward for some flailingly powerful performances. 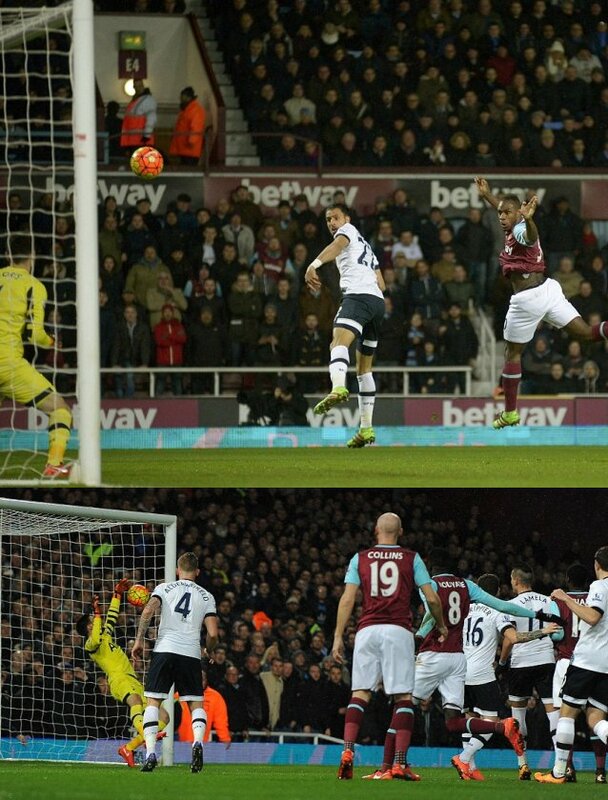 Spurs responded with a burst of affronted energy but West Ham were coiled and ready to run themselves. For a while, with Slaven Bilic skinny-tied and punkish on the touchline, West Ham put on a show of East End heavy-metal football, Emmanuel Emenike and Dimitri Payet repeatedly opening Tottenham up down the left channel. They were hard into the tackle, too, as both Erik Lamela and Harry Kane took a buffeting early on. After the interval the Spurs surge did finally come. The substitute Delle Ali made an instant difference, playing with anger and drive between the lines of attack and defence. With Christian Eriksen conducting the centre of the pitch Spurs were as dominant as they had been cowed. Too late, though, again. There has been a suggestion Spurs� real enemy is their own physical limits. Pochettino�s early mentor, Marcelo Bielsa, was renowned for running his teams into the ground. The Poch-fade has been a feature, some say, of previous Pochettino seasons. But Tottenham were not tired here. They were instead fretful. They blinked for the first time. There was no lack of energy in the second half, just a sense perhaps of some tired minds for some hard-pressed key players. Kane remains eager as ever, just a little furred at the edges. Kane completed 12 passes all night and had two shots, both off target. He still played every minute gripped with that frantic will to harry and hustle and drag the game his way. But he also has one goal from open play in his last eight games, a fine young player in his second top-tier season being pushed right to his outer limits. For the first time the lack of a high-grade alternative to share the load looks a genuine omission. Still Spurs will take heart from their energy in the second half and from their ability this season to bounce back well from defeats. Nerves were their undoing, a little vertigo so close to the peak. This team has learnt quickly. What they do from here with the lessons of that timid first half looks like another key turn in this engrossing slow bicycle race of a title run- in.